Buying handmade pottery bowls is a lifestyle choice like choosing to buy local produce or supporting a Mom & Pop store. With your purchase you get to make a difference in the life of at least one artistic soul. And there's just no comparison between mass produced merchandise and artisan created goods in terms of inspiration, quality and attention to detail. One activity produces utilitarian objects, the other creates functional art that has an undeniable, irreplaceable spirit that mass production can't replicate. When you buy a handmade pottery bowl you get to take home that spirit and continue a direct connection with the artist! I'm reminded of that every time I visit my friend Barbara. She lives in a corner of Southern Alberta where clay and the ceramic arts have deep roots. Global competition has long since closed the factories in her community, but individual potters live on and are supported by a local band of followers. Sitting down for a meal at Barb's house means sitting down with friends who may be around the table...or on it...because she gives her dinnerware names...Stevies' casserole, Linda's plate, Dawns bowl, Bob's mugs or Cindy's wine goblet! 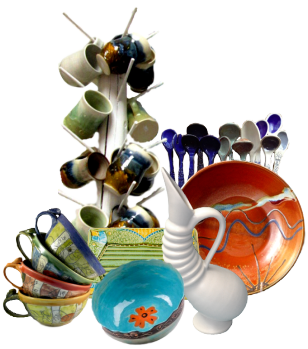 On her open kitchen shelves handmade pottery bowls are nestled together with handmade mugs, plates and serving platters. It looks like a cottage garden in June...a riot of colour and nothing matches! And it feels good to have the connection with the artist who has created the object of your affection. All good reasons to make the click and go shopping. Fingers never produce the same exact shape and glazes are never applied in exactly the same way. If you look closely at a set of four mugs and bowls you'll always be able to detect small differences. And that's one of the most touted reasons to buy handmade...you'll get something unique even if its a part of an artists run of similar bowls. But you can also find truly one-of-a-kind pieces in any potter's studio. 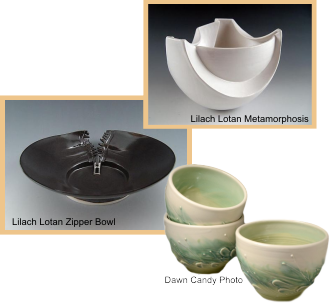 They're created because an artist has wanted to experiment with a new size, a different shape, perhaps try out another construction technique or explore how a new glaze looks on an old design. Read about what it takes to get a handmade pottery mug to market.